First Listen: The Ghost Of A Saber Tooth Tiger, 'Midnight Sun' Sean Lennon has made one of the best recordings of his career, with help from bassist, singer and partner Charlotte Kemp Muhl. The two follow their acoustic debut with a fabulously fuzzy rock album. The Ghost Of A Saber Tooth Tiger's new album, Midnight Sun, comes out April 29. 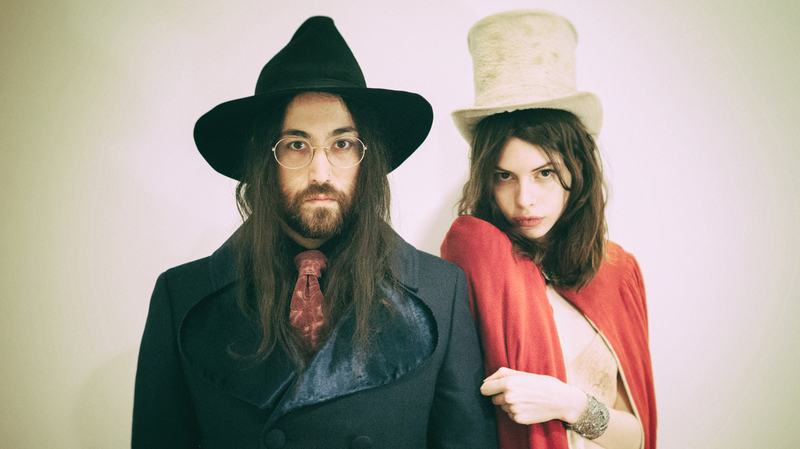 The Ghost of a Saber Tooth Tiger is Sean Lennon and Charlotte Kemp Muhl. Lennon, as you may know, is the only child of John Lennon and Yoko Ono. Muhl is a successful fashion model and Lennon's significant other of eight years. Midnight Sun is their second proper album together. Try this while listening: Imagine what your opinion would be if you didn't know these basic facts - if it was just another band on the Internet with a strange name. You might think it was some kindred spirit of Tame Impala or the Flaming Lips, soft psychedelia made for sunny summer weekends. Not so druggy that it erases the day, yet weird enough to start conversations about the kidnapping of John Paul Getty III. Now, listen again, and imagine what it must be like for John Lennon's son to make music. With his girlfriend, no less. This has been the younger Lennon's greatest obstacle since his debut, 1998's Into the Sun - the prejudice against genetic good fortune and the presumption that he sounds, and maybe acts, like his famous father because it's the easiest way to his own fame. In the past, he hasn't done himself any favors by sometimes sounding eerily like the legendary Beatle, but that seems an unfair measurement. If people are willing to believe that "there's something in the water" in any given music scene, then surely the same allowance can be made for actual shared DNA. What son is not heavily influenced by his father, even one he may have only known for a short while? Midnight Sun should go some way in dispelling those presumptions and prejudices. In places, it still sounds fairly Beatles-esque, but no more than many other bands of the last half century, and much less than Sean Lennon has before. Muhl's influence and contribution pulls him out of his own history and to places that he did not go in previous solo work, like the gloomy "Last Call" or twee "Johannesburg." The two have a natural and obvious chemistry, especially on the songs where her honeyed voice gives direction to his nasal searching. So, although it may have taken him thirty-eight years to do it, Sean Lennon may finally be moving on with his music. He has always made a fairly valiant effort to carry his legacy forward in interesting ways, to explore his very personal relationship with his near-mythical father in a very public manner. But Midnight Sun is his own musical statement, in his own voice, and one of the best recordings he's ever made.